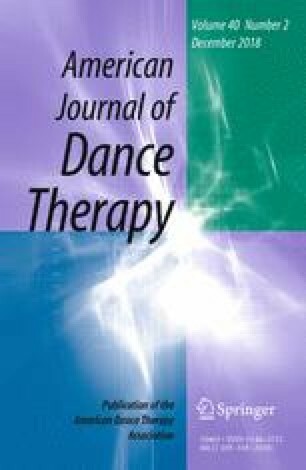 The use of dance/movement therapy (DMT) as a treatment modality for children and adults with autism spectrum disorder (ASD) has been studied extensively since the 1970s. This systematic review of studies published between 1970 and 2018 aims to (a) verify the quality of DMT and ASD studies using Preferred Reporting Items for Systematic Reviews and Meta-Analyses (PRISMA) guidelines, and (b) evaluate the effectiveness of DMT interventions for individuals with ASD. Keyword analyses of four electronic databases—Medline, Pubmed, Cinahl, and Springer Link—were used to select the studies examined in this research study, with seven selected according to specific conditions. Two studies after 2016 were identified as having the highest level of evidence at level 2b on the scale of The Oxford Centre for Evidence-Based Medicine: Levels of Evidence. Two studies conducted before 1985 were lower than level 4. Five studies after 2015 were found to have either fair or low risk of bias according to the Assessment of Controlled Intervention Studies developed by National Institutes of Health. Two pre-1985 studies were evaluated as having a high risk of bias. While this study found that the quality of DMT and ASD studies has improved in recent years, future research must demonstrate greater scientific rigor in documenting the efficacy of DMT treatment interventions. It also found that imitation (mirroring) interventions helped individuals with ASD improve their social skills. I am grateful to Cathy Appel for her helpful comments and suggestion on earlier drafts of this manuscript. Center for Disease Control and Prevention. Autism spectrum disorder. Autism and Developmental Disabilities Monitoring (ADDM) Network. Retrieved May 31, 2018 from https://www.cdc.gov/ncbddd/autism/addm.html. Center for Disease Control and Prevention. Autism spectrum disorder. Data and Statistic. Retrieved May 31, 2018 from https://www.cdc.gov/ncbddd/autism/data.html. Center for Evidence Based Medicine. Oxford Center for evidence-based medicine level of evidence March 2009. Retrieved February 26, 2018 from https://www.cebm.net/2009/06/oxford-centre-evidence-based-medicine-levels-evidence-march-2009/. National Institute of Health (NIH) National Heart, Lung and Blood Institute. Quality assessment of controlled intervention studies. Retrieved February 26, 2018 https://www.nhlbi.nih.gov/health-topics/study-quality-assessment-tools. PRISMA. (2015). Transparent reporting of systematic reviews and meta-analyses. Retrieved March 9, 2018 from http://www.prisma-statement.org/.